Joan writes: In September, 2001, Val completed his brief but successful show career (100% owner-handled!) as Champion Tidalflats Valediction. He had retired to a life of ease, devoting most of his time to the schemes that he and his buddy, Milo, could think up to perpetrate. In 2003, Val went to live by the beach, filling a void left by Suzanne's last buddy. There are more Val pictures here. Deke was the puppy called "Thump" because he was into everything and was constantly falling off of things. He finished his championship (entirely owner handled by Don). The team tried their hand at obedience, and Deke has one legs toward his CD. Deke has settled into a happy life of cuddling with mom and dad. It's a full-time job. There are more photos of Deke here. 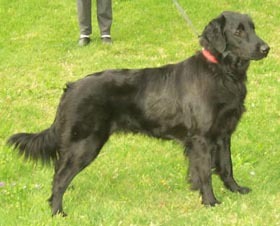 Boeller is Paula and Danny's first Flat-Coat and has taught them a lot about Flat-Coat silliness and obsessions. 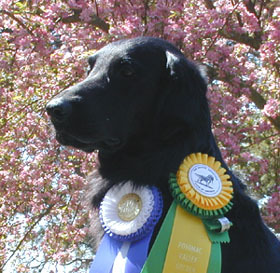 He finishing his championship completely owner trained and handled by Paula...who has also taught him a myriad of "tricks" by shaping his instinct to retrieve things. Boeller and his side-kick Briscoe have recently been joined by twin (human) brothers Dom and Sam. There are more Boeller pictures here. 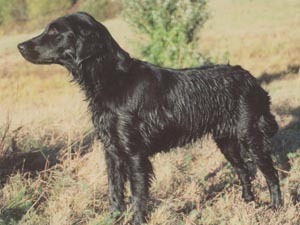 Ducky was one of the two "princesses" of the first litter. Bill has been training her as his hunting companion. She has proven to be an awesome retriever but somewhat stubborn about her recall!! 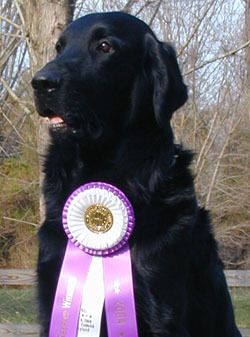 Ducky placed second in the open class at the 2003 FCRSA National. Kelly was the puppy that we almost lost at a couple of days old but she hung on and wound up being one of the fiestiest in the litter. 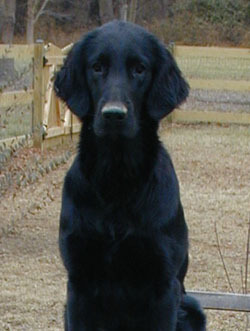 Kelly is Sue's first Flat-Coat and "alter-ego" and has effectively sucked Sue in to the Flat-Coat world. 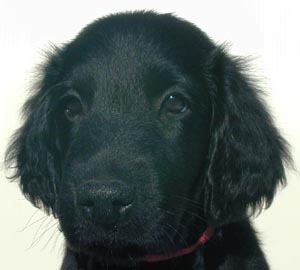 Kelly was not shown, but has been busy in field and is currently the youngest MACH2 flat-coat in the country. In summer 2006, Kelly was struck by a car and lost her leg, essentially ending any further agility career. Here is a pictuers of Kelly as Sue's deck hand. 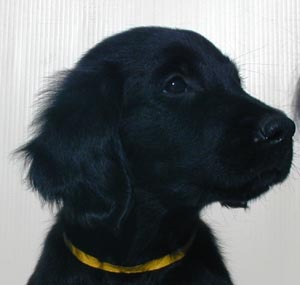 Selkie is the puppy that we kept and has her own page here. There is something incredibly special about the puppies from a first breeding and this silly girl is no exception. We love her dearly! Skiff is the puppy that we kept from our second litter. We think he demonstrates the "beauty and brains" we strive for in this breed. 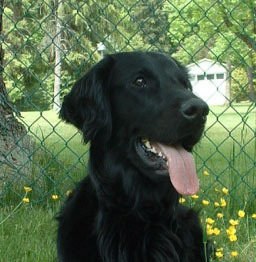 He keeps us laughing and reminds us daily that Flat-Coats boys are the best! His page is here. Cooper was the smallest Boat Boy. We rarely hear form his owner, so only have a puppy picture of him. 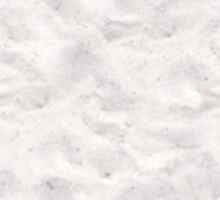 We do know that he is a much loved part of his family and is lucky enough to travel to the beach frequently. 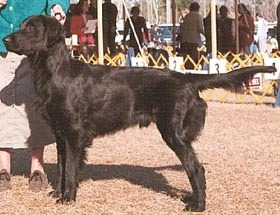 Roan was one of our top show picks and also showed an aptitude for birds and retireving. Unfortunately, he was killed by a car at the tender age of 7 months. Very sad. We do not currently have any litters planned. Surf here for information on obtaining a quality Flat-Coat.